Yesterday, just as I was finger-tap dancing out my new blog, my almost new laptop made a groaning noise, flickered her eyelids a few times and disappeared into silence. Apparently she has died, which is not game on at all, at only 4 months old. This is when I realise with a jolt, that there is a body of ocean between me and a laptop hospital. It matters not one jot how brilliant the technology is, how fulsome and encouraging the communication, which by the way was first with Jamaica, then Holland, then India. I felt quite well travelled after visiting all those countries, and in such a short space of time, and I believe I made a couple of new friends, one of whom is definitely looking out for Island Wife to be published in her part of the world. Are you sitting there in skimpy shorts with a Coolade on the rocks? I asked her and she laughed uproariously. Not one of the questions I am supposed to answer! she replied, and that is when I mentioned my book, knowing I could say anything I liked at that point and she would be bound to listen, even if that piece of information wasn’t on her Answer Sheet either. Today I feel a bit odd, to be honest. 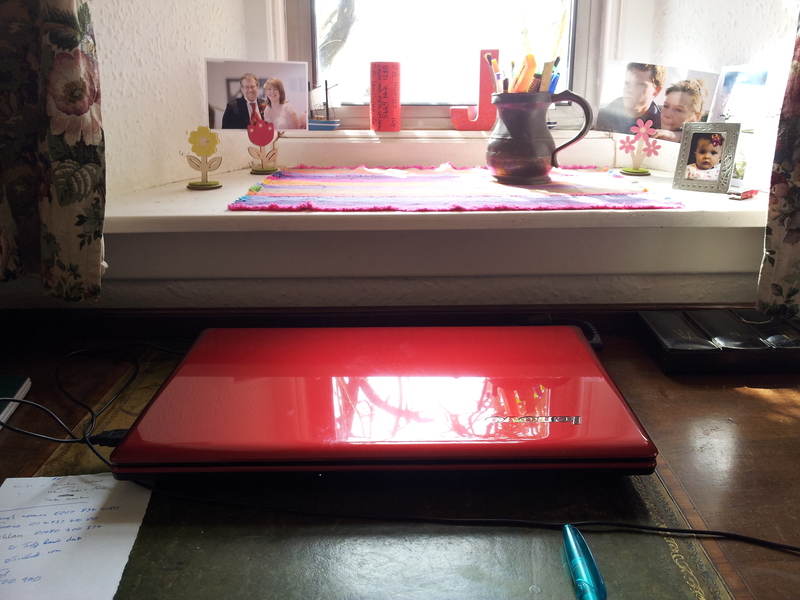 My nice new red laptop sits in silence, with her flaps shut, on my desk and there is no sound of that thinking hum with which she has, to date, filled the room. Perhaps that’s the problem. She has been way too cheerful working with me and somebody doesn’t like it. When I spoke to that nice young Dutchman, he did suggest various attempts at CPR, such as flipping the laptop over…. Sorry, I whispered…..such indignity…….and taking out the battery. Then replacing it after a number of seconds and pressing the on button 10 times (exactly). Then he asked me to do something requiring a lot of pressure on the Delete button that upset all her settings right back to the ones she came with, and they took long enough to get rid of when she first arrived. I didn’t know her at all after that, and so the bereavement process will be shorter I believe. All my orderly little icons and boxes are quite gone now, and it is only with foresight that I had asked my husband to back up all files and documents and pictures and so on onto some flashing box that normally drives me mad on dark nights when it suddenly springs into life and turns the sitting room a luminous green. I won’t moan about it ever again I promise. So, the box sits on the ground, complete with warranty information and laptop-shaped polystyrene in a fetching green, and all we need now is for Miss Jamaica, or Mr Holland or even Madam India to call on Monday with a return address. However, I doubt it will be Madam India, as I was fairly sure after a confusing exchange of information, that I had dialled a Flight Booking Service and almost took myself and the laptop to somewhere south of Mumbai.